These are dual channel gating systems for small animal or human MRI applications. It sends cardiac trigger pulses to the MRI when a respiration signal is in the quiet phase. Pre-processing filters and gain controls further refine the quality of the signal and ensure reliable triggering. 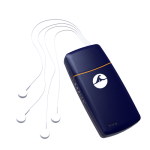 Includes adapter cables for monitoring with a BIOPAC Research System. Delay – adjust from 1-50 msec. Cardiac signal (ECG or BP) from either an ECG100C Electrocardiogram Amplifier or a MPMS200 Micro Pressure Measurement System. Respiration signal from a DA100C General Purpose Transducer Amplifier with a TSD110-MRI small animal respiration pad. The DTU can also be used as a single-channel gating unit—just use one analog input signal, either cardiac or respiratory. Threshold: The ECG or Blood pressure signal passes through a user selectable threshold that creates a square wave (0-5 volt) cardiac trigger signal. The R-wave or BP signal crosses the threshold in both directions to initiate the MRI trigger signal pulse. Delay: A delay control allows precise timing of the trigger signal pulse relative to the rising or falling edge of the ECG R-wave (1-50 msec). 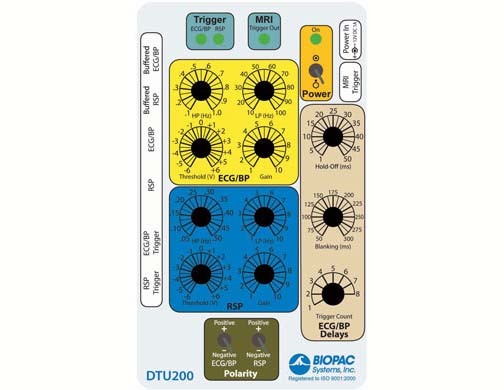 Blanking: A blanking control provides a time discriminator (50-300 msec) that prevents the DTU200 system from falsely triggering on an ECG signal corrupted by MRI operational artifact. 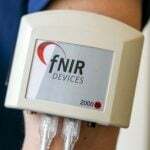 Monitoring: The cardiac trigger channel is available for monitoring purposes; we recommend monitoring this signal with a BIOPAC Research System (adapters included for MP160/HLT or MP150/UIM). Threshold: The respiratory system also passes through a similar threshold to create a square wave when the signal crosses the threshold in both directions. The quiet period is user-selectable to be the interval between rising and falling edges or falling and rising edges of the RSP signal. Monitoring: This signal is available for monitoring purposes; we recommend monitoring this signal with a BIOPAC Research System (adapters included for MP160/HLT or MP150/UIM). The MRI trigger channel only outputs a cardiac trigger when the respiration trigger channel goes into the quiet period, which occurs when the animal is between breaths and still. The system will output a precise number of cardiac triggers between each respiratory period by adjusting the trigger count control (1-8). Cardiac cycles are only considered if they occur >100 msec after the respiration trigger goes into the quiet period. If there isn’t enough time to complete the required number of triggers, the unit will stop and wait for the next quiet period before starting a new count. For example, if the counter is set to output 5 triggers, but there is only enough time to send 4, the unit will ignore the fifth trigger and wait for the next quiet period before starting the count again. There are outputs for the cardiac and respiration conditioned signals (available at BNC ports: Buffered ECG/BP and Buffered RSP) and the respective triggers. The conditioned signals are in the ±10 volt level range and trigger outputs are 0-5 volts. Adapters for BIOPAC Research Systems are included: seven BNC to 3.5 mm monitoring cables (CBL102 for MP150/UIM) and seven 3.5 mm to RJ11 adapters (CBL122 for MP160/HLT). The unit will interface with either a BIOPAC Research System (MP160, MP150, or MP100). It will also work with third-party amplifiers and data acquisition systems that operate in the ±10 volt range.